How do I get started with lecture recordings? UNSW has enabled staff to record their lectures and share them with their students for their educational benefit for over ten years, under the service name UNSW Lecture Recordings. We have written this page to help ensure that staff learn what they need to know so that they can hit the ground running with minimal disruption. We strongly recommend that staff master the core functionality captured on this page, and then review our strategies for active learning page (Transforming lectures), before using the new functionality in their teaching. Download our Quick Reference Guide here. Review the slides for the Orientation to UNSW Lecture Recordings+ sessions, delivered prior to 2017S2. View the Students Guide to LR+ here. This can be added to your Moodle course to help students better understand how to use UNSW Lecture Recordings+. For courses that support live streaming, view the LR+ Livestreaming Support here. To help minimise any impact on staff and students, we had kept the Echo360 ESS service online for approximately six months since Lecture Recordings+ was made available on the 3rd July 2017. As it is not technically possible to migrate old Echo ESS Moodle links, these have since stopped working as the Echo360 ESS system was decommissioned on December 4th, 2017. As a result, all recordings from the past service have been migrated into the new UNSW Lecture Recordings+ service and are available for linking. 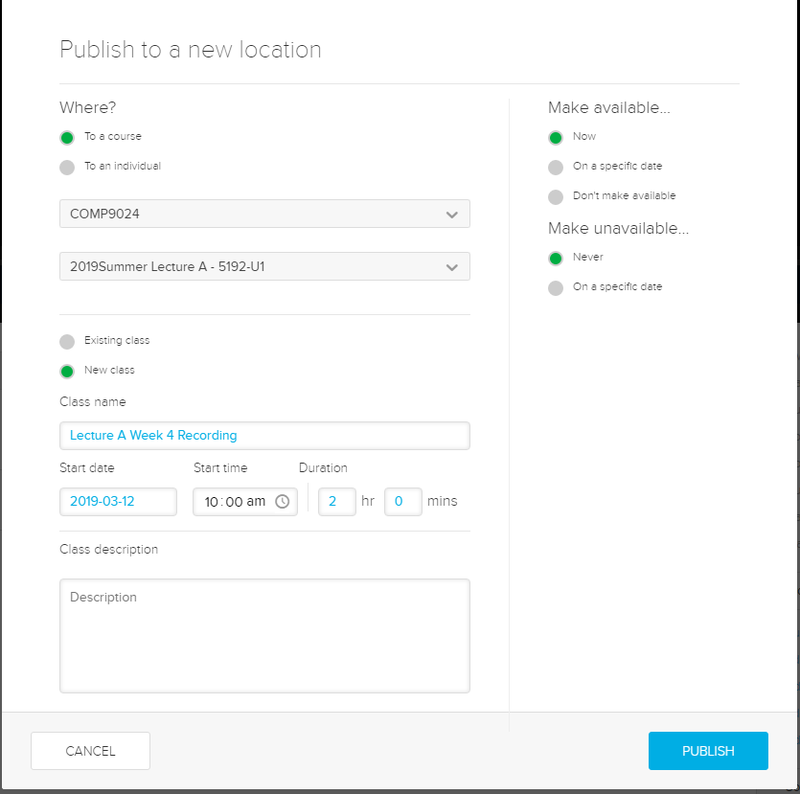 To continue to share past recordings after the service is decommissioned, you will need to create new links to the migrated recordings in the new service. Instructions for this can be found in the 'Sharing my lecture recordings in Moodle' section below. You should consider hiding past links in Moodle rather than deleting them so that any associated user activity is kept for reporting purposes. This section discusses how lecture recordings are scheduled. In accordance with UNSW policy, all lectures timetabled within a lecture recording enabled venue, within weeks 1-10 of term (weeks 1-12 of semester for UNSW Canberra), are automatically scheduled for recording. 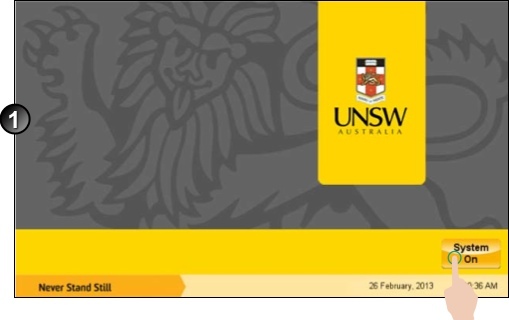 All scheduling details are automatically populated by the timetabling interface within myUNSW and any later changes to a schedule within myUNSW will automatically update the schedule within UNSW Lecture Recordings+. We recommend that you contact your school/faculty timetabling officer if you wish to check or update your current timetable and/or lecture recording schedule. Note: Tutorials and other timetabled events are not recorded. All scheduled recordings in recording enabled rooms will begin at 5 minutes past the hour and conclude at 5 minutes before the hour. If you would like to see which venues are enabled for lecture recording, please click here. Advise your school/faculty timetabling officer to add that week to the timetable before the trimester starts. For Undergraduate Medicine / Law courses, lecture recording information updates should be sent via a request to the IT Service Centre. If you are timetabled within a lecture recording enabled venue but do not wish to be recorded, you will need to opt-out via MyUNSW. For assistance doing so, please contact your school/faculty timetabling officer. Instructions on how they can do this can be found here. Warning: While it is possible to share a lecture recording with your students and then delete the class/recording at a later date, we highly recommend that you do not do this. Deleting a class/recording will delete all associated student data, including analytics for your use and any student notes. These cannot be recovered. Special events or individual room bookings are not automatically scheduled to be recorded. All such requests should be made to the UNSW IT Service Centre who can manually schedule this for you. This section talks about the requirements for this service to make the experience better and also the constraints one might face. Visit the lecture theatre on the day, and leave a five-minute gap at the start and end of your lecture for students to arrive/leave the venue and make their next class. This time period is not recorded. Ensure that any teaching materials that you wish to be recorded, such as PowerPoint slides or other materials, are displayed via the venue primary projector. Note alternative video inputs such as the document camera or personal device can also be recorded in this way. Keep close to the podium microphone, or wear the lapel microphone, to ensure that your voice is picked up clearly. Alternatively, you may wish to obtain a wireless microphone, but please speak to your venue support team first. We highly recommend that if you intend to bring a personal device such as a laptop or tablet into the venue, to have a test session ahead of time. This is because many devices support a digital encryption standard known as HDCP (high definition copyright protection) that will prevent the video signal from being recorded. This is not a bug in the system, rather your personal device actively blocking recording. If you have reason to suspect a physical venue issue, such as disconnected cable or broken equipment, or you need assistance using venue equipment such as the podium AMX controller or connecting/testing a personal device ahead of time, please contact venue support. For centrally supported venues, the best contact is x54888 (CATS AV). Conversations held near the podium may be inadvertently picked up and recorded by the venue microphone or camera equipment. For this reason, we strongly recommend leaving the podium area and/or venue, before having a private conversation with any individuals. On the lectern touchscreen, tap the System On button. The system will take 20 seconds or so to power on. On the main menu screen, select the appropriate input (example, Internal Computer). Refer to the posted information in each lecture theatre for more detailed information on how to use the touch screen. 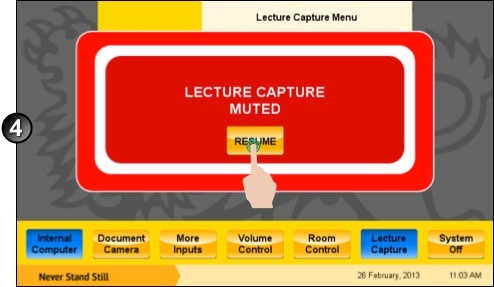 Previously the mute button in the lecture capture menu muted the audio and continued recording video. As of Semester 1 2016, this feature now freezes both audio and video in CATS venues. Just prior to muting recording input, announce "Lecture capture is about to be paused." This will alert viewers that the video and audio is intentionally being muted, and saves them worrying that they are having technical difficulties. 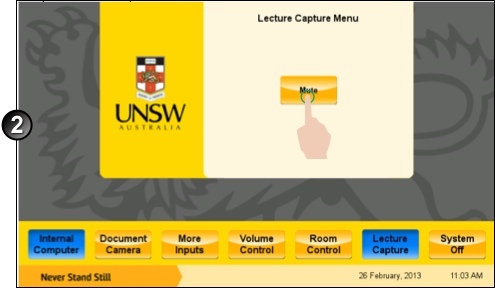 From the touchscreen main menu, select Lecture Capture. 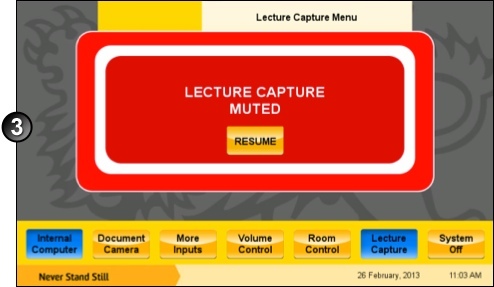 On the Lecture Capture Menu Screen, tap Mute. The red light on the lectern will begin to blink and the message Lecture Capture Muted will display. Tap Resume to turn muting off and resume the lecture recording. For staff who wish to explore new classroom tools functionality in a venue for the first time, such as interactive questions or the Q&A discussion forum, we recommend practising ahead of time. While the tools are fairly simple to use, it is still best to ensure that you know how to use the tools, and have a backup plan, before going live. Not all students will have an appropriate device to interact with the UNSW Lecture Recordings+ service. Ensure your lecture plan takes this into consideration and does not assume all students can participate, perhaps with an attendance question slide or show of hands at the start of the lecture to gauge rough numbers. Not all venues have equal wifi capabilities, due to a range of factors. Student interactions using the confusion flag or in a Q&A forum may be too challenging to monitor while delivering your lecture. For this reason, we suggest that teaching staff should set students' expectations at the start of the class, by advising students that you will only address the top liked questions or most "confused" slides in a break or after the class, encouraging students to answer the rest. Anonymous posts by students are not anonymous to the instructor. We recommend informing students of this in your first lecture. The first five minutes of a lecture will typically have the highest bandwidth usage as students enter the classroom, connect to Uniwide, login to Moodle, connect to the UNSW Lecture Recordings+ service and automatically download the lecturer's uploaded PowerPoint. While a typical PowerPoint is very small and this is very quick, the combination of many students doing this at the same time may result in some students' devices temporarily timing out. However, this should sort itself out within a couple of minutes once students complete downloading the PowerPoints, freeing up bandwidth for others to use. After this, wifi dependency is typically very low. UNSW is continually improving wireless infrastructure across our campuses as part of the AAA project. For now, a rough wifi capability gauge is available on the venue list page. Learn how to use PowerPoint with Lecture Recordings+ and use it for a better classroom experience. There are multiple methods of delivering a lecture with the use of PowerPoint and UNSWLR+. Each option has its advantage(s) and disadvanatge(s) which instructors need to consider when making a choice. Similar to the past system, instructors will continue to have the ability of uploading and using PowerPoint slides interactively during their class. This includes users of both Operating systems; Mac and Windows. Using the PowerPoint file either from Moodle or a personal storage device Instructors may choose to upload their PowerPoint slides to Moodle and deliver the class from there. Note that UNSWLR+ records the signal sent to the primary projector of the screen at the lecture venue. 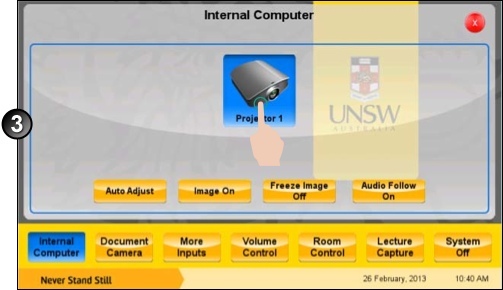 This means that when you open the presentation on the primary screen of the lecture venue, UNSWLR+ will record it automatically. In case you decide not give students access to the presentation(text version), you may use a personal storage device such as a USB instead of uploading the PowerPoint on Moodle. Students will be able to view the presentation on the recorded video instead. Instructors do not have to make any changes to their current practice of delivering lectures. The advanced functionalities of PowerPoint are retained. Instructors will not be able to view the analytics data such as confusion flags and Q&A forums of the presentation. This data is of great assistance when considerations regarding the re-design of presentations need to be made in future. By default the PowerPoint will be visible to students, but you can hide certain slides of the lecture if you wish. Once your lecture begins, you can use the class controls to progress through the slides. Click here for instructions on how to do this. Students will be able to take private notes against individual slides. The PowerPoint can be uploaded using the instructions below, without any difficulty. You will be able to view the analytics at a later stage to determine if changes to your presentation are required. You will be able to seamlessly use the powerpoint together with interactive slides if any without having to switch to multiple windows/tabs. Advanced powerpoint functionality such as transitions, animations and other plugins may not be supported. This is because both Microsoft and Echo360 have a vested interest in ensuring that Powerpoint / Echo360 products are distinct and unique. Using the PowerPoint ribbon add-on for Windows This ribbon is only available for Windows users specifically for 2010, 2013, and 2016 versions of MS Office. The add-on can be downloaded via the Settings tab (located at the top right-hand side, beside your name) when you are logged in as an instructor on the ALP site. Click on Downloads and navigate to PowerPoint Ribbon. This add-on integrates the features of UNSWLR+ into the PowerPoint allowing users to maximise the use of both. Instructors will be able to deliver their lectures from either their personal device or the venue Windows device. Detailed instructions can be found here. Instructors will be able to get the benefits of both services, either via a windows laptop, or via the windows podium computer, without switching in real-time. Currently, this add-on is not supported by Mac OS. Instructors have the option of using Powerpoint with its advanced functionalities and the interactive elements of UNSWLR+ simultaneously by alternating between tabs (Use alt-tab). Instructors using any operating system get full access to benefits of PowerPoint as well as UNSWLR+. Staff must switch in real-time, which can be a logistics problem. Signing into the Microsoft PowerPoint Echo ribbon. 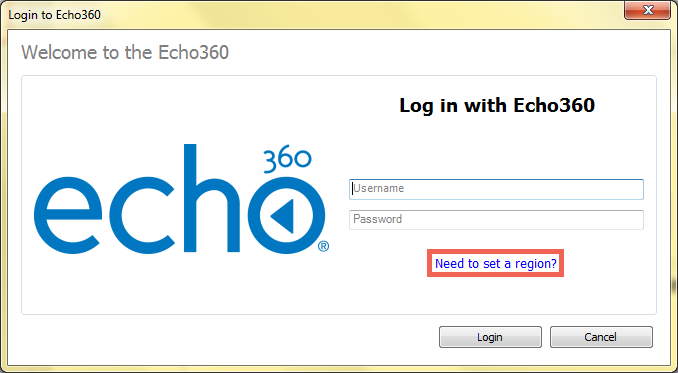 Signing into the Echo PowerPoint ribbon requires a direct Echo360 password to be created prior to being able to use this tool. You may create your own Echo360 password once you have signed into Echo and are logged in by clicking on Settings followed by Account Settings and within the password area, selecting Create Password. Detailed information regarding these steps can be found here. Note: The password you create for yourself within Echo is applicable to Echo360's external applications (such as the PowerPoint ribbon tool), creating this password will not affect/change your UNSW zPass nor will it affect your access to other UNSW sites and resources. As this password does not expire, please set it to something memorable and should you ever forget the password, you can always reset it by going back to your Echo account settings when logging into Echo via Moodle. Once you have an Echo360 password set up, you may log in via the PowerPoint ribbon. Please ensure the region is set to 'Asia Pacific' (Click Need to set a region) and log in using your UNSW primary email address and your direct Echo360 password. For a general overview and more information, click here. Instructors can share lecture recordings with students via their Moodle course. 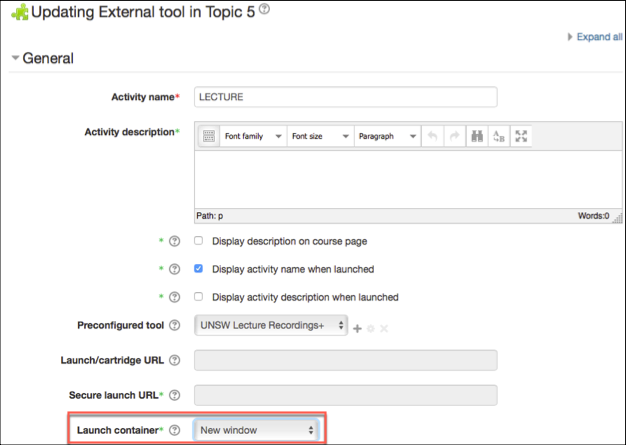 Instructors (with appropriate access) may share their lecture recordings with their students in Moodle, via the UNSW Lecture Recordings+ activity. This is very similar to the previous and flexible EchoLink activity method. The previous EchoBlock method, which was already limited at the time, is not supported. Login to Moodle and select the relevant course. Click Turn editing on and navigate to the section of the course where the link will be added. Select Add an activity or resource from the toggle menu. From the list of activities select UNSW Lecture Recordings+ and click Add. Write a suitable name for the lecture recording and click Show more. Change the Launch container setting to New Window. This will allow instructors to maximize the use of screen space when delivering a presentation in the lecture. Click Save and display. 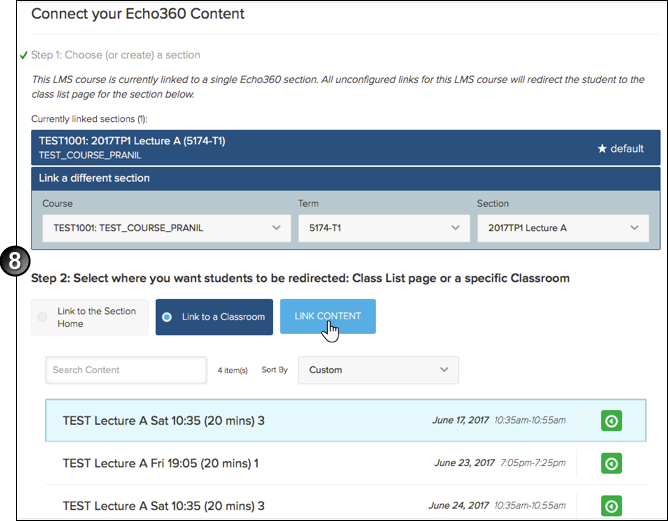 You will be directed to the Echo360 dashboard where you can see the courses you have access to, and select the lecture(s) to be linked. 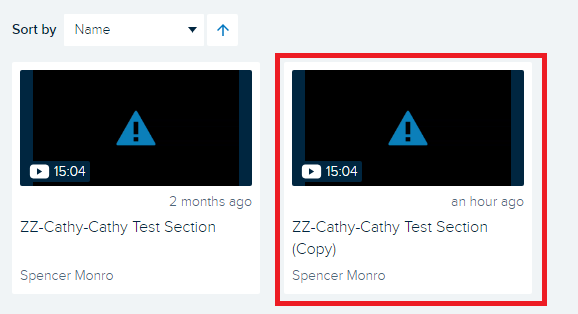 Sections with lecture recordings that have already been shared (if any) within the course will appear in the default area. This is useful if you share lecture recordings one at a time, throughout the term. 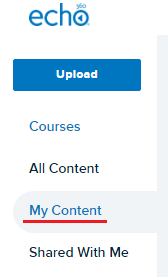 If you wish to share lectures in a section / lecture stream that has not yet been shared within the Moodle course, select from the list from what you have access to, and click Link a different section. This will appear in the default section moving forward. Once you have made a selection, you can choose to share the entire class list by clicking Link to the Section Home, and then Link Content. If you do this, your future lecture recordings will become available to students automatically. Alternatively, you can choose to share a single lecture recording only. To do this, click Link to a classroom, select the specific recording, and click Link Content. 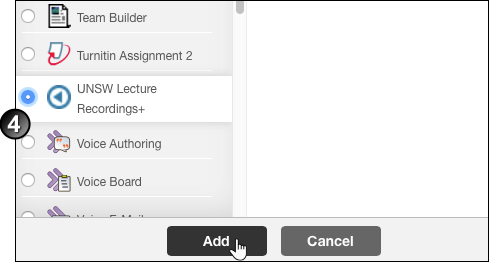 NOTE: This simply makes it easier to control how lectures are displayed to students within Moodle, for example, you could share one lecture per week in this manner. However the single recording remains within the Echo section it was originally recorded in. This means students will be presented with the one recording, but can use the navigation to access other recordings using Echo's navigation within that section. In many cases this will not be desired. In this case the "sharing past lecture recordings in Moodle" steps should be followed instead. Primary instructors (typically a course convenor) can share their past lecture recordings with other instructors or future courses using the UNSWLR+ Library. This is typically needed when a lecture cannot occur due to a public holiday or illness, but a previous term's recording exists. Instructors can share lecture recordings from a previous term in their Moodle course. For example, publish 2016 S2 recording to a 2018 S1 Moodle course. Note: Do not perform a standard Moodle linking to a past recording, because you will be sharing previously used interactive components such as questions, comments or answers to exam etc. to the students in the future term. Furthermore, any student interactions in the future course will be merged with the past student’s interactions. 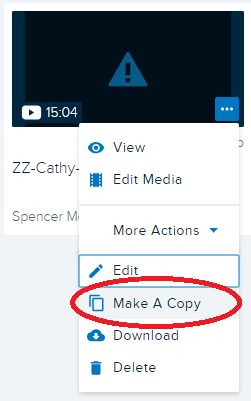 Therefore follow the steps below to create a duplicate copy of a past recording, which does not contain any previous activities and allows it to be safely shared with future courses. 7. Choose the course (e.g. ARTS1234) and Section (e.g. 2019 Trimester 1 T1) that you wish to publish. Note that you can only publish one recording at a time. Fill in the details and click PUBLISH when you finish. Now your previous recording is shared to your new class successfully. You can easily cut the parts of a lecture recording you are not happy with and control whether your students can download a lecture recording or not. How can I edit my recordings? 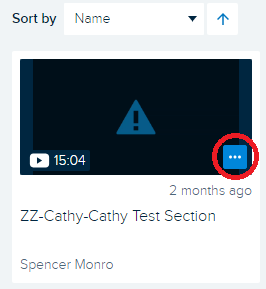 You can edit a specific lecture recording by visiting your library, selecting the video and clicking the Edit Video button. For detailed steps on how to do this, please visit the edit my recording page. You can control whether students can download a lecture recording within Settings. Downloading is enabled by default. For detailed steps on how to do this, please visit the enable/disable download page. Know more about the features of the library where your content is stored. Every staff member has their own Library area, where all their content is ultimately stored. Content is located within this area, whether or not it has been made available to the students. Presentations that you have prepared for the class are automatically added to the library. Lecture recordings, and edited lecture recordings, are automatically added to the library. Content that you manually upload into the library for later use, can be published into one or more classes as needed. If another instructor shares their content with you, this will appear in the library within the Shared with me section. For further details, see How do I do more? Staff can raise a Feature Request to have any requirements that they have identified to be considered for a future release of Echo360. Note that Echo360 is a proprietary product and feature requests are submitted back to the Echo360 company for their internal decision making for future releases of the software. To view a list of Feature requests for the TELT systems, please click here. If you have a feature request, please follow the following process. Submit your request to your Faculty ADE and TELT Business Advisory Group representative. Your representative should then log this feature request as a ticket with the IT Service Centre if they agree that the feature request is valid. In the request, ask the service desk to assign the ticket to LT.TELT.SUPPORT. Feature requests will be discussed amongst the Faculty ADEs and EMR Advisory Group members. Feature requests will be collated on a monthly basis and reviewed by the TELT Business Advisory Group. The TELT Business Advisory Group upon reviewing feature requests will advise TELT of which feature requests they believe should be implemented. TELT will consider the input from the subcommittee and other factors (e.g. timing and other projects) to prioritise feature requests. Your Faculty ADE or representative is responsible for reporting the outcomes of new feature requests back to the requestor.